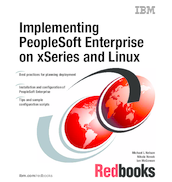 This IBM Redbooks publication will help you plan, install, and configure PeopleSoft Enterprise with PeopleTools 8.44 on xSeries systems running DB2 and WebSphere on Linux. This information is based on installation experience gained while installing PeopleSoft at the IBM International Technical Support Organization Center in Research Triangle Park, North Carolina, and on customer support experiences. This publication is especially useful for those who are installing and implementing PeopleSoft on Linux for the first time. Basic knowledge of DB2, WebSphere, and Linux is assumed.